Using the same sugar cookie dough I used for the pinwheel cookies, today I made mandarin and ginger flavored sandwich cookies. 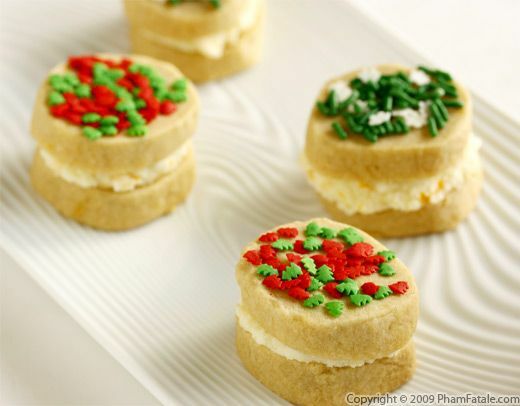 The flavor is repeated in the cream as well, and to give the treats a holiday vibe I topped them with green, red and white Christmas sprinkle toppings. I know it's the holiday season when the citrus trees in our garden start producing copious amounts of fruit. 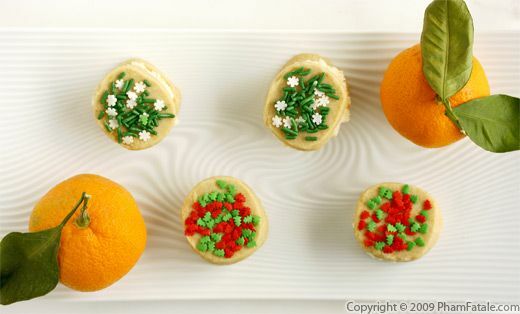 I took some Chinese mandarins from the garden to make these cookies. They were so incredibly fragrant and sweet that after eating all the segments, I couldn't throw away the zest. I think they were put to good (and delicious) use! After all the cranberry apple dishes I've made so far, I incorporated the same flavors and created pretty pinwheel cookies. The swirl is a lot easier to make than it seems. All you need is sugar cookie dough to roll around the filling. My choice for the filling was cranberry apple butter but you can use any other filling you like. Don't get scared by the yield of this recipe! We're getting prepared for Christmas and make our logs of cookie dough in advance and store them in the freezer. They make great gifts, and the cookies are small and delicious, so they'll disappear very quickly. Sweet potato pie is a classic American dessert that is not overly sweet. 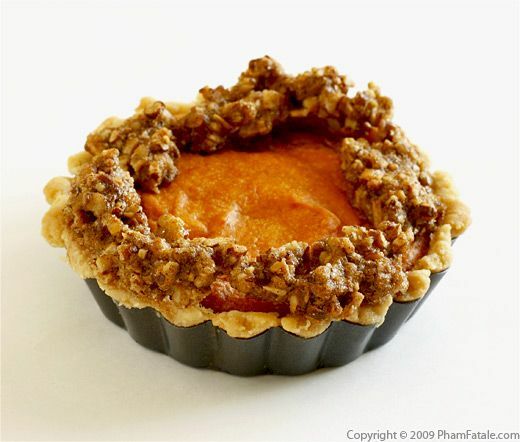 The texture is similar to a pumpkin pie, but firmer. I jazzed mine up with a little anise extract, other flavorings and a crown of pecan crumb topping. It's a great pie for Thanksgiving, but really, you can enjoy it any time of the year. I made this for a reader named Bill who e-mailed me a request for a sweet potato pie recipe. If you're reading Bill, I hope you like it! This recipe is a riff on a classic apple crisp. If you've been reading my posts lately, you'll know that I've been on a bit of a quest to find creative ways to utilize our Thanksgiving leftovers. A cranberry apple crisp seemed like the perfect destiny for the leftover cranberries the fridge. It's an incredibly easy recipe to make. If you have cranberry sauce, then all you really need to do is to add a sweetener, prepare the topping and bake the individual servings in the oven. They are great for intimate holiday parties. The possibilities for stuffed mushrooms are almost limitless. They are perfect as passed hors d'oeuvres and they're incredibly versatile and easy to make when you're pressed for time. We have a dinner party tonight, and I wanted to use the leftover stuffing from Thanksgiving. 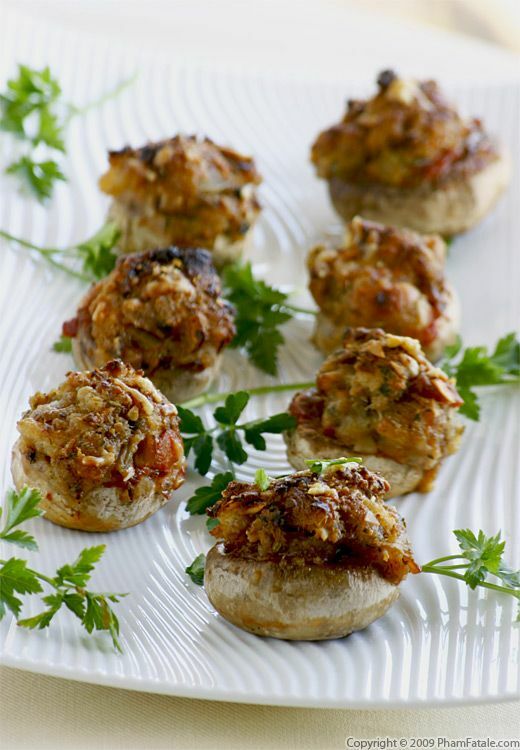 "Stuffing-stuffed Mushrooms" has a nice ring to it, no? I boosted the flavor of the stuffing with parmesan cheese, sliced almonds and crème fraîche. To smooth out the texture, I incorporated some crème fraîche to the stuffing and brushed the mushrooms with tomato sauce and tomato paste as well. Once each button mushroom is filled with stuffing, sprinkle on some more parmesan, bake, and they're ready to serve! Page 2 of 13 pages.